As I near the end of my time here in South Africa I sit to write this note. A summary of my time that might give new volunteers an idea of what to expect. Before I began to write I dutifully reflected on the last 2 weeks and considered what I might say. What were the highlights? How was the work? Was I happy here? As my mind began to sift through the countless encounters, adventures and emotions it began to dawn me that in 2 weeks here I have lived and experienced more than 2 years at home. Now don’t get me wrong! I have a good job, good friends and a great family. I love my life. I didn’t come here to fix myself. I’m not a tormented soul searching for answers or looking to escape a broken life. I came here because I love animals. I wanted an adventure, I love to learn and I wanted to get involved. I packed my bags and announced to my family and friends that I was travelling alone to South Africa. I delighted in the shocked looks that people gave me and I smugly boarded the plane feeling incredibly chuffed with myself altogether. I can tell you now that when I hopped on that plane I had absolutely no idea what I was doing for myself. I had unknowingly given myself an amazing gift. Elephants walk quietly, each step as soft as the next. They trumpet when excited and they have this long deep rumble that they can sometimes use to greet another elephant or person. I stood one day at the old Pine tree watching the herd. They were close by grazing. I had no reason to be afraid. There are very experienced guides who are always with the elephants. They know the elephant’s language and they see them as part of the family. I’m honest enough to admit that the love and respect between the guides and elephants at times made me jealous. I was doing some observations for the research projects that are ongoing at the park. There were no Tourists at that time. The sun was being reasonably kind and everything was peaceful. Keisha one of the large female elephants came over and leaned lazily against the tree a few feet from me. She looked as if she wasn’t that bothered about anything that day, including me. She was soaking up the quiet atmosphere and good weather the same as I.
I glanced at one of the guides and he nodded for me to go to her if I wanted. I walked the few steps to her and she turned her head to acknowledge me. I placed my hand on her forehead and began to gently massage it. She adjusted herself, slightly lowering her head to give me a better reach so I knew then that she liked it. She stayed perfectly still and for the next few minutes I stood with my hand on the forehead of a giant. A giant that wanted me to stand with her. I listened to the warm air puffing occasionally from her trunk and felt it blow onto my foot like a long lazy sigh. She was blinking slowly and I almost started to feel sleepy. How could a creature that size make you feel so calm in her presence? Then from the silence she gave a long deep rumble. I didn’t just hear it, I felt it. It resonates through you and leaves butterflies in its wake. A minute later she took two steps backward and bowed her head slightly to the side in what resembled a gentle curtsey. She moved toward me again swaying to my right gently moving past me to re-join the herd. That for me was the defining moment of my trip. It woke me up to what I was really doing. There were many more times I was able to interact with and touch the elephants on a daily basis. The work can be hard sometimes like when the boma has to be cleaned. But by no means are we overworked or treated unfairly. If I had done any less I would not have felt like a volunteer. The guides are all gentlemen and my fellow Volunteers are wonderful people. Everyone who works here is lovely. You settle in quickly and can do what you like at the weekends. Last weekend I went swimming with seals. This Friday the Volunteers are going to a local school where we will make Christmas cards with the children. Friday night we will have a braii ( Barbeque) here at the park. Saturday I’m going to Hike the Roberg Penninsula inhabited once by some of the first humans to walk the earth. Then perhaps I will have cocktails on the beach afterward. Sunday I’m off to church where I will hear an African choir sing. That evening I hope to spend time with the other volunteers whom I now consider to be some of my closest friends. 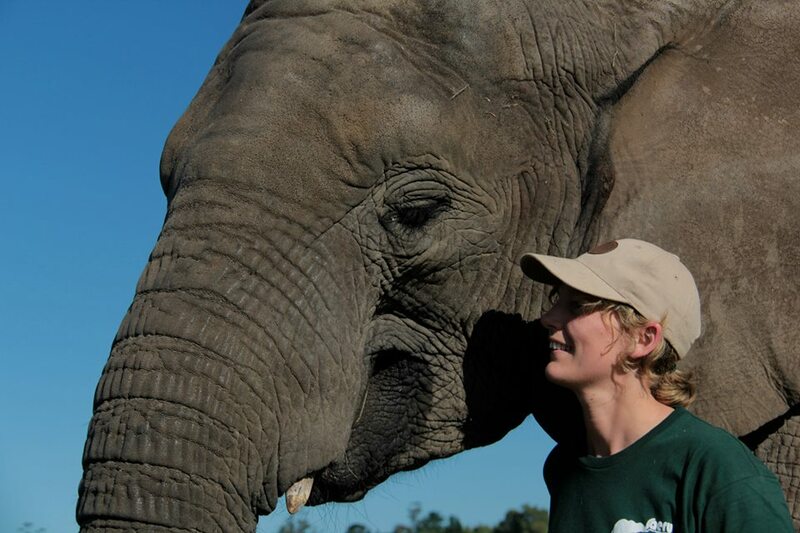 Monday I say my Goodbyes to the people and the elephants and I leave South Africa with a broken heart. Previous Post Looking to earn money to finance your gap year?